I really enjoy romance novels but considering how prolific the genre is, its not uncommon for a boring and uninteresting title to somehow end up on my bookshelf. 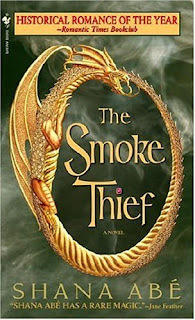 The Smoke Thief starts out enchantingly enough with a prologue detailing the history of the Drakon people. The font, typeset and page backgrounds in the prologue and epilogue sections are very artistic and weave moods of intrigue and fantasy. The novel is very adventurous to start but the exchanges between Rue and Christoff are just too predictable and redundant throughout the book. The dialogue isn't witty and is very historically plain considering the time period. At about halfway through The Smoke Thief , my mind started to wander and I began to yawn repeatedly, having to deliberately force my attention back to the book. Other titles I have attempted to read by Shana Abe are The Last Mermaid and The Secret Swan . I regretfully say that I will no longer seek out Shana Abe's romance novels.